The poetry anthology Days Begin … was conceived to help to raise money for a new Cancer Centre at Colchester General Hospital. In this development a range of treatment services will be consolidated in such a way as to improve patients’ experience and quality of life. In pursuit of this worthy cause some forty-odd excellent poets have contributed poems – some previously published but a good many being new work. The contributors were not asked to write on any particular themes; but the editorial team invites the reader to see the contents as a loose sequence of beginnings / realisation /hope /resignation / envoi. Readers who do not choose to monitor these categories too closely will, in any case, find a reading experience similar to that of enjoying a well-edited, well-produced poetry magazine (with the bonus of a piece of attractive artwork by Barbara Peirson). Several London Grip reviewers have recently remarked on the particular difficulties of writing about an anthology since one cannot expect to be able to comment on an author’s breadth or narrowness of range and style or upon the ways in which certain themes and images are repeated or developed. What one can say is that the poets appearing here have offered work of a uniformly high standard even while writing in a range of forms and moods. The poems are all short – none occupying more than a page – and care has clearly been taken with their ordering. In a short review one can only mention a few of the poets and poems in this book. I feel somewhat like a judge in a poetry competition who makes the standard opening remark to the effect that all the entries were of a remarkably high standard before proceeding to nominate three winners. In choosing the following extracts, however, I am not so much awarding prizes as simply attempting to give an overall sense of the pleasures awaiting in this selection. I’m behind her, staring at her blue woolly hat. The fishmonger leans in, how are you doing? (no eyebrows), turns back before I can smile. passed my father’s Summer of Love. An unknown younger man came back. To take me away from wherever you are. And finally, what anthology would be complete without the appearance of a few animals? We can watch, with Katrina Porteus, a fulmar hurl its breast / To the wind’s unseen geometry; with Nancy Mattson we can meet a dog who is only five years old but born mournful ; and we may sympathise with the limited life-chances of Antony Dunn’s pair of goldfish in a bowl / who never turned a corner / in their lives. If some of these quotations have whetted your appetite I can assure you that I could easily have come up with another ten attractive extracts from different poets. 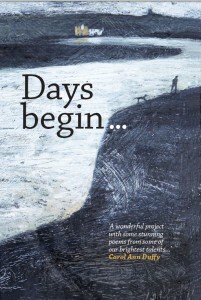 Days Begin … is available from Wivenhoe Bookshop via http://www.wivenhoebooks.com/contact/ and may also be purchased at a number of launch events currently being arranged. The next one is on November 6th as part of the Camden reading series at 1 Buck Street, Camden, NW1 8NJ. Start time is 7 pm. Thomas Ovans is NOT (as some google searches might suggest) a Nashville-based, Boston-raised street rocker. Instead he lives in London and has a background in technical writing and editing. He is also a regular reviewer forLondon Grip. His own poems have appeared most recently on Ink Sweat & Tears and The Stare’s Nest.